An Ohio family is an a court battle with a judge who denied their teen son’s request to legally change his name. 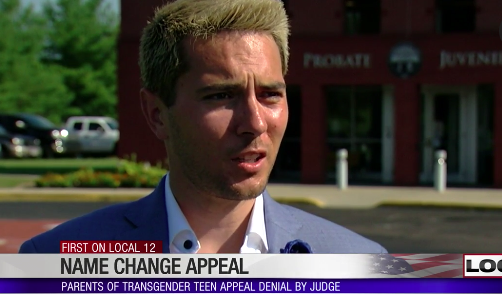 Leigh and Kylen Whitaker went to the Warren County Probate Court this week to appeal Judge Joseph Kirby’s decision last month that denied the family’s request to change their transgender son’s name from Heidi to Elliott. “We thought it was just a formality, basically,” Leigh Whitaker told WKRC. But the judge’s reaction to the name change was anything but a formality. The family says they were taken aback by some of Kirby’s questions during the hearing. But Elliott had already gone through extensive therapy. “Children change significantly and rapidly,” Kirby wrote in his decision and requested that he wait until he becomes an adult. “I’m also upset that a judge who spent less than 20 minutes with our child in an intimidating setting knows better than both parents, the child, a licensed therapist and a doctor specializing in transgender issues,” Leigh said.